To introduce ABC Text Converter, we are offering a $24.95 SPECIAL LIMITED TIME OFFER for this version! Click here to order now! Key features of conversion to PDF using ABC Amber Text Converter program include 40/128 bits PDF encryption, different PDF security options, page size and page orientation support, resolution mode, compression mode, etc. 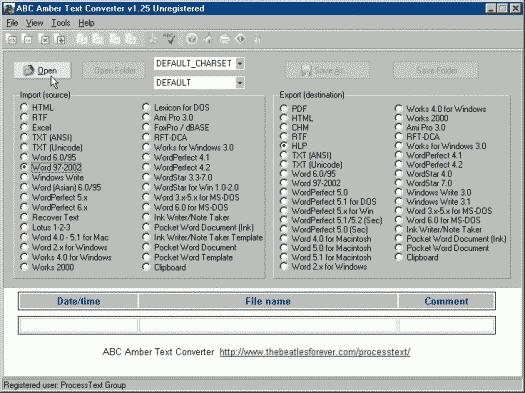 ABC Amber Text Converter is the award-winning, powerful batch tool to convert documents to PDF, HTML, RTF, TXT (ANSI and Unicode), DOC, XLS, MCW, WRI, WPD, WK4, WPS, SAM, RFT, WSD, and more. It's easy like ABC and powerful like amber.